How is Turntable Different from Record Player? Home » Guides » How is Turntable Different from Record Player? 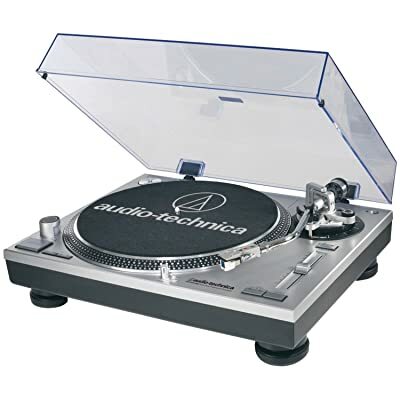 Is it possible to have a turntable separately? Well, it is possible these days. If you already have amplification units and speakers, you’ll only need a device that produces high quality sound. There’s no better machine than turntables to produce high-quality sound. Just in case, you’ve never seen turntables before, or get curious watching this device for the first time, this post is going to answer all your concerns related to it. This article will take you through the essential elements that give turntables their own identity. Furthermore, it will highlight how a turntable differs from a complete record player system or home stereo system. It is the basic component of all the analog players – cassette players, CD players and those large vinyl record players. It has a round surface which is used to rotate the CD while other components of it extract the stored sound waves and replay them via built in speakers. Introduction of microgroove vinyl records (LP format), in place of old shellac-based records with 78 rpm. The LP format offers greater range, durability, quieter surface and longer play-time. As mentioned earlier, turntable is the base unit for carrying and rotating the record, but it requires other things to produce sound. Motor: A motor is attached to the turntable platter that drives it at the specified speed. There is a control circuitry for switching and adjusting speeds. Tone Arm: There is a long movable arm located at the side of the turntable that carries the pickup. It contains the wires, the flexible metal at the moving end, and a magnetic cartridge at the fixed end. Stylus or Needle: It is the only part that contacts the vinyl surface and picks vibration in the grooves. The needle or stylus is fixed with the tone arm with its pointed end touching the vinyl surface. It moves across the record in arc-like motion generated by the tone arm, and allows the vibrations to travel across through the wires towards the cartridge. Cartridge: It converts the vibrations into low-level electric signals. Amplifier: turntable is connected to the amplifier (externally). It enhances the signals coming from the cartridge and converts them into sound waves. The quality of sound generated by the turntable depends upon these components. In fact, if any of the component underperforms, it impacts the quality of sound. Plinth design and base construction: either platter is isolated from the base and motor by means of suspension. Alternatively, all the elements are mounted onto the solid base. If all components are separate from each other, it will be easier to replace any one of them without disturbing the other components. Record player is a comprehensive mechanism that combines turntable with amplifier and speakers. Sound production was nothing more than a fantasy before 1870s, until finally Thomas Elva Edison came up with his phonograph – the earliest form of record players that went through series of modifications and improvements and became what it is today. Earlier models; radiogram and stereogram, had large sizes in which all the components were combined. These models ruled until 1960s, until the introduction of 45s singles. With small-sized records came portable solutions, such as battery-operated players. Some record players had a size slightly larger than records. Later, cassette players and 8-track players ruled the market due to smaller size and cheap price. At the same time, record player manufacturers introduced semi-portable devices, such as the popular suitcase-style players. After the emergence of cassette tape, comes a trend of assembling different music playing devices connected to the amplifier. This setting is known as the music center. A typical music center had cassette player, radio, 8-track player and a turntable connected to the amplifier in one unit, while the speakers joined separately with the amplifier were placed in the second unit. Introduction of Compact Discs (CDs) reduced the size of the music centers significantly, and there were regarded as Mini HiFi systems or Midi. These systems were barely larger than the size of a CD. Soon, digital downloading became popular, replacing compact disc formats with USB players and Retro-style players. This trend is associated with vinyl records giving rise to the vinyl record players yet again. Now, you can store vinyl albums into the computer and create their MP3 formats to listen to them via iPods and USB players. Retro-style players are also popular these days, featuring turntables as the main source, and adding other options such as radio, CD players, and cassette players. This may be considered as a replication of old radiograms, but they have smaller size and lightweight materials. Here, it is worth mentioning that a standalone turntable connected externally with amplification unit and speakers, gives highest-quality sound compared to record player with built-in components. If you want a record player with uncompromised sound quality, there are some great models but they’re also quite expensive.